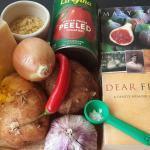 My Favorite Cookbook is an ongoing Guest Blogger series on The Good Hearted Woman. If you are interested in writing a post for this series, you can find submission guidelines here. My favourite cookbook came to me as a gift, of sorts, from a colleague. Jim was a producer at the radio station where I was the marketing manager. He saw me eyeing off one of the books in his publicity stack and offered it to me. 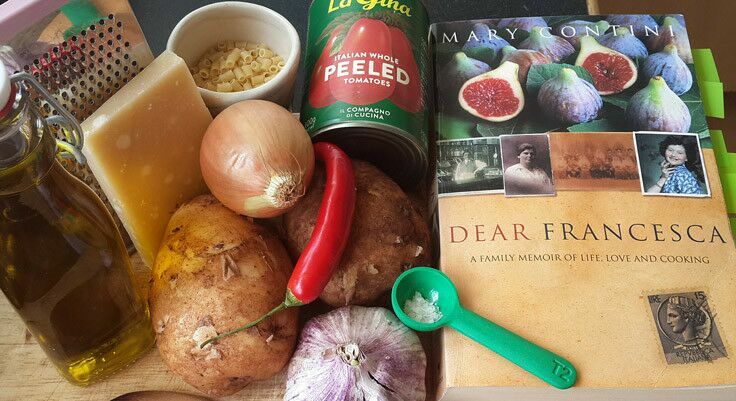 I soon discovered that Dear Francesca by Mary Contini is both a cookbook and a love letter to the role food plays at the heart of family life. Mary Contini’s world revolves around food: she is the director of one of Edinburgh’s biggest delicatessens, Valvona & Crolla, she has written a food column for The Scotsman, and has co-presented food programs on television. Dear Francesca is a very personal offering, almost a love letter to the role that food plays at the center of family life. Contini’s Italian heritage informs every page, and the family stories she shares are as delicious as her recipes. Sprinkled throughout is advice for her daughter, the Francesca of the title. For as long as I can remember I’ve loved cooking. But that love was not passed down to me from my mother. Though she was a dedicated homemaker, my mother detested cooking. Perhaps it was the daily grind of having to churn out meals for her large family — I’m one of ten. Or perhaps it was because, early in their marriage, my father fondly, and constantly, reminisced about his own mother’s brilliant cooking. Whichever, my mother embraced the concept of convenience food with a vengeance. Rice-a-Riso, Deb Mash Potato and Continental Chicken Noodle Soup – just add water and stir – were three of her staples. I hate to think of the salt and chemicals we ingested as children. After the wooden spoon, the can opener was her most-used kitchen tool. I still remember my surprise, and delight, when I discovered spaghetti didn’t always come in cans. At least she never overcooked any of her ‘staples’. On the rare occasions when she cooked from scratch, she always managed to eliminate both flavour and goodness. One early standout was her mushy, over-salted peas to which bicarbonate of soda was added, “to keep the colour”. My first tentative steps were via packet-mix cakes because there were instructions to follow. I was happy to be left alone in the kitchen, and even happier when I received cookbooks as birthday and Christmas gifts. Until Dear Francesca, I never felt I’d missed out on anything. But to me this book was a bitter-sweet read. How wonderful to have been guided in such a loving way. There is an Italian saying, “dalla nonna alla mamma” – “from the grandmother to the mother”. This speaks of the way recipes, food advice, and by extension, life skills, are handed down through generations like a precious gift. Whenever I dip into Dear Francesca, I feel like Contini is speaking directly to me, offering me her valuable advice. Early in the book there is a comprehensive list of equipment every kitchen needs. At another point she gives detailed information about how to introduce children to different tastes, and why it’s important to do so. Remove seeds from chilli, if necessary. Heat oil in a large heavy based saucepan and add garlic and chilli to pan, cook for about thirty seconds then add peeled and finely chopped onion. Toss to make sure onion is coated in oil, turn heat to low, cover and sweat the onion for about ten minutes. The tomatoes should be smooth – I put them through my passatutto, or sieve, which also removes the seeds. But if seeds aren’t an issue you can either blend or mash with a fork. Add tomatoes and 1 litre of the water to pan and bring to a high simmer. Add peeled and diced potato and salt, give it a good stir, turn the heat down, cover and cook on a low simmer for about 30 minutes. Remove garlic, add the remaining water, which has been heated to boiling, and the pasta, stir and cook, uncovered, until pasta is al dente. Taste for seasoning and serve with shavings of cheese and crusty bread. Recipe makes approximately two litres of soup. 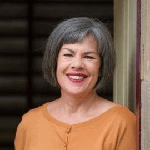 About Kathy: Kathy lives in Hobart, the capital of Australia’s island state, Tasmania, which is a food lover’s paradise. 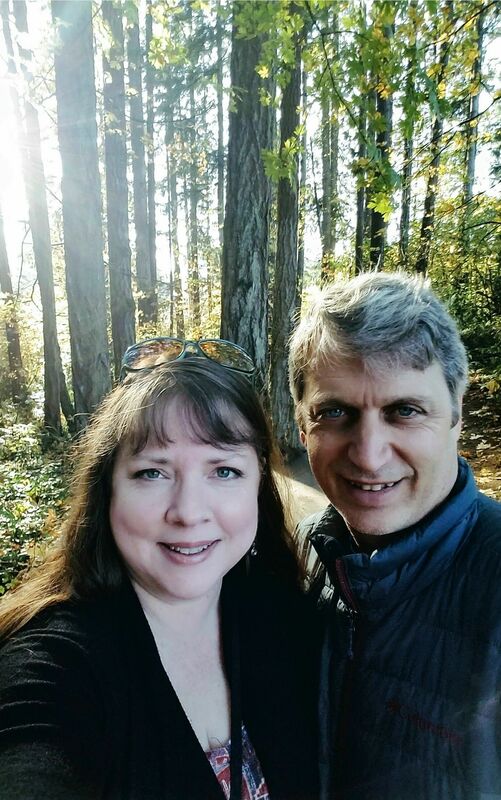 In early 2015, Kathy took a redundancy and started a blog about her favourite things – reading, writing and travel. She has also written a novella, Juliet’s Journey, which was inspired by a visit to the northern Italian village of Baiardo. Kathy regularly contributes articles to Boomercafe.com and Amreading.com. This sounds like not only an amazing cookbook but an amazing read as well. Growing up in an Italian family, I’m always drawn to the stories and dishes that came from that region. I will definitely be checking this one out! I love reading books that are a mix of personal stories and recipes because food is so closely tied to family. This one sounds like it meant so much to you, Kathy. This favorite cookbook series is so special! I love how meaningful collections of recipes can be! I love dipping into this book every now and then — it’s summer here in Tassie so I’ll be making limoncello soon — Mary’s limoncello recipe is the best I’ve found. Thank you so much for having you a your guest! Thank you for the great guest post, Kathy! I’m so glad you are continuing this series! This cookbook sounds wonderful. The cookbooks I am drawn to these days have personal narratives woven between recipes, and this sounds right up my alley! Thank you so much for the opportunity to share my favorite cookbook. It’s summer in Tasmania now so I’m about to make Limoncello and Mary’s recipe for Limoncello is the best I’ve found. Happy Christmas everyone!